This, performance, or at least the highlights from it, was seminal in my operatic education and tastes. Sometime in the late 1950s I returned home from college to find that a new HMV LP of highlights from the recording was the family pride and joy. I knew Traviata and Rigoletto from the family LPs, the latter on the Cetra issue with Taddei and Tagliavini as the jester and Duke respectively. But I recognised the music of Don Carlo as being of a different breed to the composer’s middle period duo, and it haunted me. The impact was most pronounced in listening to Boris Christoff’s heart-rending singing of Philip’s great lonely soliloquy Ella giammai m’amo (CD 2 tr. 8) and the portrayal of Rodrigo by Tito Gobbi, whose account of the noble, selfless soldier’s death has never been equalled on record (CD 2 trs. 19-20). As to the duet between the two, even in my then complete operatic naivety, I recognised it as being a truly great performance of great music (CD 1 trs. 13-16). The premiere of the original five-act form of Don Carlos at the Paris Opéra on 11 March 1867 was only modestly received. The Italian translation, as Don Carlo, premiered at Bologna in September 1867 and in Rome and the remainder if the Italian peninsula. So far as critical reception was concerned it fared little better. Both the Italian public and theatre managements found the opera overlong and were slow to take it to their hearts. It was not long before the act three ballet and then the Fontainebleau act were dropped in performances. The arrival in Italy of the shorter and grander Aida, in 1871, added to the difficulty of the opera’s length. After a failure in Naples in the same year Verdi made his first alterations to the score for a revival under his own supervision. Still the fortunes of the opera disappointed the composer; as early as 1875 he began seriously to consider shortening the work himself. With other demands he did not begin serious work on this until 1882 concluding his revision as a four act opera the following year with the premiere having to wait until 1884. The new shorter four-act revision involved much reworking to explain the sequence of events and maintain narrative coherence. Verdi’s revision also involved the removal of the Fontainebleau act, the ballet and the Inquisitor’s chorus in act five as well as other detailed changes. The premiere of the new four act Don Carlo, which has become known as the 1884 version, was a great success at La Scala and featured the tenor Tamagno who created Otello three years later. At the time of this first studio recording in 1954 it was common practice to perform the 1884 four-act version. This situation began to change after the Covent Garden performances under Giulini in 1958 with a tendency to include the original Act 1 music. Performance practice now often goes further with the inclusion of music that Verdi reluctantly cut before the Paris premiere when it became obvious that the length of what he had written would cause Parisians to miss the last trains home if it was given in full! What is evident in the original, and even more so in this 1884 version, is Verdi’s more complex chromaticism compared to his great middle period operas. Accommodation of this increased orchestral complexity requires a sure and steady hand at the rostrum. In the period since this recordings first appearance Gabriele Santini’s conducting has received criticism from some quarters for its lack of drama and dynamism. I first owned the complete recording when it made its CD debut in the late eighties. With the rather boxed and occluded sound I did not then appreciate the conductor’s dramatic virtues and pacing of the work. Mark Obert-Thorn’s remastering brings the whole sound-stage, and particularly the voices, into a more forward focus and aural balance causing me to radically change my view. I now find Santini sympathetic to both Verdi’s complex lines and to the unfolding drama. Of the other soloists besides Gobbi and Christoff, Antoinetta Stella also benefits from the added clarity of the recording. She is not a spinto more a strong lyric soprano. There are moments of strain but her Tu che la vanita (CD 3 tr. 2) is far superior to that of Montserrat Caballé on the extensively eulogised Giulini studio recording of 1971. 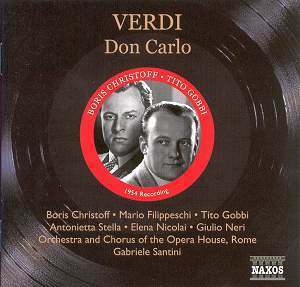 Mario Filippeschi sings with excessive stress as Carlo. He has neither the tonal beauty nor vocal elegance evident in Bergonzi’s interpretation on the 1965 recording conducted by Solti (Decca) or the vocal virility of Domingo for Giulini, both recordings of the five-act version. Likewise Giulio Neri as the Inquisitor hasn’t the power of Talvela for Solti and Talvela makes the confrontation with Ghiaurov’s King hair-raising. The Bulgarian mezzo Elena Nicolai as Eboli is uneven in the Turkish aria (CD 1 tr.7) and whilst finding O don fatale (CD 2 tr.15) more to her liking, she fails to invest much colour in her tone. She lacks the distinction or ease of Agnes Baltsa in Karajan’s 1978 recording of the four-act version (EMI). Quality renditions of Eboli’s diversely demanding music are also given by Grace Bumbry for Solti, Shirley Verrett for Giulini and Fiorenza Cossotto on Santini’s 1961 stereo recording (DG) of the five act version that also features Christoff as Philip and Antoinetta Stella as his queen. The appendices include over ten minutes of Björling and Merrill in the act 1 duet. Recorded in the RCA studio in New York in December 1950 (CD 3 tr. 7) those sessions of duet recordings included other Verdi as well as Puccini and the evergreen favourite duet from Bizet’s Pearl Fishers. The date of the duet recording here is given as 30 November 1950. Other sources say 3 January 1951. Whichever, the sound and the singing are first class in this remastering. Björling sang in the 1950 Met production of Don Carlo mounted as the introduction to Rudolf Bing’s regime at the theatre. It is a pity that he never recorded the role. It is also to be regretted that no studio recording of Ezio Pinza’s Philip exists either. His sonorous tone, steady legato as well as plaintive expression of the emotions in his rendition of Philip’s lonely soliloquy would have graced any recording (CD 3 tr. 9). Marian Anderson’s 1934 O don fatale (CD 3 tr. 9) is more interesting than idiomatic (CD 3 tr.10, whilst Mattia Battistini’s Felice ancor io son…Per me e giunto and O Carlo ascolta (CD 3 trs. 11-12), from 1913, celebrate a singer and Verdian style no longer found.